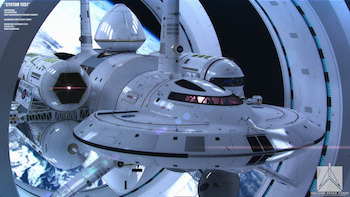 While it has yet to be confirmed, NASA engineers studying the controversial EmDrive may have discovered it generates Star Trek-styled warp fields. Right now there are a lot of people wanting to go to space. And I'm not talking about the Mars colony folks or future asteroid miners - I mean the people who want starships that can visit other solar systems. Now if a group of NASA engineers talking shop online are to be believed, there's a pretty strong chance science stumbled across a warp drive by accident. So here's the necessary backstory. Way back in 2000 Roger J. Shawyer developed the EmDrive, a proposed spacecraft propulsion system that doesn't need fuel as a propellent. By 2006, the concept faced heavy criticism for violating the law of conservation of momentum - not to mention a distinct lack of peer review to his research. Eventually teams in China and the US, including a group at NASA that investigates fringe proposals, constructed their own versions for testing. These devices promptly surprised everyone by working even when nobody quite understood how. It wasn't enough to get us to space, but was interesting enough to warrant future research. Skip ahead to this month, where we have a propulsion device that somehow produces microwaves to generate thrust. According to posts on NASASpaceFlight.com, someone at NASA wondered where the thrust came from and used a tool to measure variances in light's path-time. What this tool recorded is that when lasers are fired through the EmDrive's resonance chamber, some of the beams start moving faster than the speed of light. If everything checks out - and on the surface the math does - it means the EmDrive is producing some kind of warp field. Once again, this is not a confirmed warp drive we have on our hands. Critics will point out the effect could just as easily be caused by atmospheric heating, which means the test has to be recreated in a vacuum. But if that test produces the same results, a lot of very intelligent people around the planet will absolutely lose their minds with excitement. Of course, getting a warp field large enough to propel a spaceship creates its own problems, but it could be a very small, very significant step all the same. At this point, it's necessary to throw up a very important disclaimer: None of the information here has been verified, peer-reviewed, or is considered academically sound. By tomorrow, someone could realize they made a mathematical error, or conducted measurements in metric and the whole thing will fall apart. But right now, very smart people are considering this to be a legitimate possibility that needs further study. Disclaimer ends.